Sometimes I really wish I was a full-time journalist. You know, the type that works for one of the major media outlets and possesses an exponentially larger amount of clout than I currently posses. I’d be lying if I said the prestige and benefits of such a position weren’t some of the many reasons I’d love to be that kind of writer. But another, less greedy reason I dream to be a professional is because I’d also have the ability to occasionally finagle access to some of the biggest names in the game. With that kind of access, I could potentially find answers to so many of the innumerable questions I have about the sport. would sepp even be willing to hear my question? probably not if it has to do with MLS. It’s cliché, but anyone who’s ever wanted to be a reporter has dreamt of asking those hard-hitting questions that nobody seems to ask. Of course, you can only ask so many of that type of tough questions before those in the game no longer want to talk to you. But every once in a while, there comes a time when you’re allowed to bust someones balls and demand answers to the questions that never seem to get answered. And if you ask me, right now is one of those times where an important question needs to be answered by one of soccer’s biggest names. So who is this name I wish I had access to: soccer’s biggest whipping boy, FIFA president Sepp Blatter. Ignore for a few minutes that my desire to ask hard-hitting questions of Blatter would place me at the end of an enormously long line of others with pertinent questions for FIFA’s head honcho. It’s a line that never gets any shorter, and the questions many would like King Sepp to answer are wide-ranging and ever-changing. But I feel I have question for him that is extremely relevant right now. For anyone who even haphazardly follows MLS, that quote just ground a thousand gears. No professional leagues recognized by American society? Clearly Blatter has missed out on the league’s steady increase in attendances over the last five years. It appears, too, that he’s missed out on the US television networks tripping over one another in their efforts to secure Premier League, Champions League and World Cup broadcasting rights. Yeah, it’s not the domestic league they’re clamoring over (for now). But show me a league that doesn’t have issues its trying to overcome, and I’ll contemplate calling MLS a failure. Now if you didn’t think to keep track of whether Sepp would accept and evaluate the MLS in person, worry not — I did. 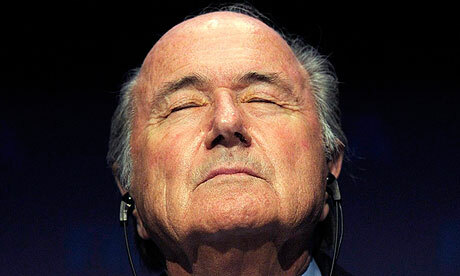 And surprise, surprise: Sepp has yet to take up the Soccer Don’s offer. Despite making his proclamation nearly a year ago and publicly receiving the invite shortly thereafter, he just couldn’t find the time to spend 90 minutes at a match in an North American city. don garber would have been more than happy to entertain sepp anytime. Now to be fair, Garber’s initial offer was to host Blatter for one of the 2013 season’s First Kick matches in early March. After all, Sepp is a busy, globetrotting guy. So I’m willing to forgive him for not being able to make it to one of the seven opening weekend games. But there were 331 other MLS matches played this year between the regular season, playoffs and the All-Star Game that he could have attended instead. That’s eight months of matches. Not that he or FIFA can’t afford it, but I’m sure the comish would have been more than happy to spring for tickets for any one of those games. I’d even guess that Garber and Co. would have rolled out the red carpet, thrown another semi-pointless press conference and held a Google Hangout with pre-arranged soft questions for him, too. Yet he still couldn’t find time to attend just one. You might be thinking, “Blatter could just be saving his appearance for the big shebang at the weekend!” Well, I hate to break it to you, but he’ll almost certainly be missing the MLS Cup Final, too. With the World Cup Draw scheduled for tomorrow afternoon in Brazil, it’s highly unlikely that Sepp will grace Kansas City’s Sporting Park with his presence. In fact, the last and only time the FIFA president has taken in an MLS match in person? The 1996 All-Star game. And it’s not as if that match seven years ago should have tainted his opinion of the league: nearly 79,000 fans packed the old Giants Stadium to see the East All-Stars beat the West 3-2 after a sparkling performance from el Pibe. Added up, it seems like Blatter’s opinions of Major League Soccer are based exclusively off of secondhand accounts, hearsay, and a lone game from 1996. And he’s thus far proven uninterested in finding out first hand if any of his thoughts were true or not. Hell, I can’t even dig up any evidence of Blatter even responding to Garber’s offer. Sadly, it’s probable that I already know the answer: never. The king is more than content to sit on his throne in his Swiss castle and judge us from afar.